Although still debated by historians, the plague has been responsible for at least 3 great pandemics and multiple epidemics in history. The first spread occurred from the Middle East to the Mediterranean basin during the fifth and sixth centuries CE, killing approximately 50% of the population in these areas. The second pandemic afflicted Europe between the 8th and 14th centuries, destroying nearly 40% of the population. The third pandemic started in approximately 1855 in China, and, although it has been mostly controlled, it is still ongoing. One reason for plague's reemergence may be global warming, which is ideal for increasing the prevalence of Ypestis in the host population. One study has estimated a more than 50% increase in the plague host prevalence with an increase of 1º C of the temperature in spring. Another reason may be the human population explosion worldwide, which is bringing humans into ever-increasing contact with wildlife. Lastly, the dramatic population increase will contribute to conditions of overcrowding and poor sanitation—conditions ripe for plague hosts and vectors to flourish in. Additionally, there has been significant concern over the return of plague as a potential biological weapon. [8, 9, 10, 11, 12] In 1347, the Tartars catapulted bodies of plague victims over the city walls during the siege of Kaffa, and, in World War II, the Japanese dropped bombs containing fleas inoculated with Y pestis to infect their enemies with the deadly illness. The organism can be transmitted from a host to a human via the bite of a vector (usually a flea), via close contact with infected tissue or body fluids, and via direct inhalation of aerosolized bacteria. 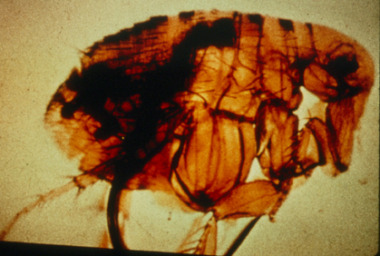 Currently, the most common form of transmission involves the bite of an infected flea. More than 200 different rodents and species can serve as hosts. The vector is usually the rat flea, Xenopsylla cheopis. Thirty different flea species have been identified as able to carry the plague bacillus. Other carriers of plague include ticks and human lice. A flea is shown in the image below. Three forms of the plague exist: bubonic plague, pneumonic plague, and septicemic plague. The bubonic form makes up approximately 80-95% of cases worldwide  and is caused by deposition of the bacillus in the skin by the bite of an infected vector. If the vector is a flea, bacillus proliferates in the flea's esophagus, preventing food entry into the stomach. To overcome starvation, the flea begins a blood-sucking rampage. Between its attempts to swallow, the distended bacillus-packed esophagus recoils, depositing the bacillus into the victim's skin. The bacillus invades nearby lymphoid tissue, producing the famous bubo, an inflamed, necrotic, and hemorrhagic lymph node. Spread occurs along the lymphatic channels toward the thoracic duct, with eventual seeding of the vasculature. Bacteremia and septicemia ensue. The bacillus potentially seeds every organ, including the lungs, liver, spleen, kidneys, and rarely even the meninges. The most virulent form, pneumonic plague, results from direct inhalation of the bacillus, which occurs from close contact of infected hosts or from aerosolized bacteria such as may occur if used as a biological weapon. A severe and rapidly progressive multilobar bronchopneumonia ensues with subsequent bacteremia and septicemia. Secondary pneumonic plague is caused when an infected patient seeds his or her lungs and airways. The third type of plague is a primary septicemic plague. This is hypothesized to occur when the bacillus is deposited in the vasculature, bypassing the lymphatics. Early dissemination with sepsis occurs but without the formation of a bubo. This usually is observed in bites to the oral, tonsillar, and pharyngeal area and is believed to occur because of the vascularity of the tissue and short lymphatic distance to the thoracic duct. Worldwide, plague occurs within a broad belt in tropical, subtropical, and warmer temperate climates (see the image below). Its geographical distribution coincides with that of the rodents it infects, which are found on all continents except Australia. 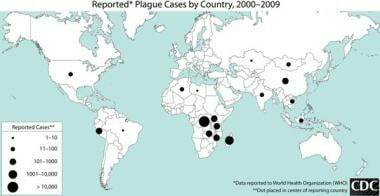 Plague epidemics have occurred in Africa, Asia, and South America but since the 1990s, most human cases have occurred in Africa. The three most endemic countries are Madagascar, the Democratic Republic of Congo and Peru. 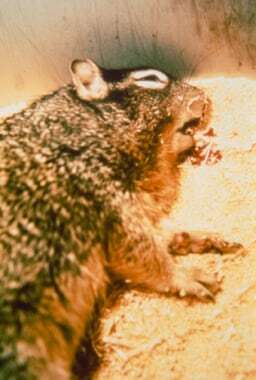 Bubonic plague has a 1-15% mortality rate in treated cases and a 40-60% mortality rate in untreated cases. Septicemic plague (primary or secondary) has a 40% mortality rate in treated cases and 100% mortality rate in untreated cases. Pneumonic plague (primary or secondary) has 100% mortality rate if not treated within the first 24 hours of infection. More than 50% of cases of plague occur in males, probably because of greater participation in outdoor activities. Approximately 50% of cases occur in persons younger than 20 years.